Dale (left): Alright anamatronic Dale, you go do the parade & wave while I go ride Splash Mountain! Dale: Gee, Chip was right all along. I really am a nuthead. Dale: "Hey, Self", says I..."Self?? Yoohoo!! Saaayyy something, fool. "..Chip's right...I don't listen. Dale: Psst! Dale! I'm you from the future! I've come back in time to warn you all of the terrrrrible danger that's coming, one that will seek to destroy the world and...hey, look, a pie! Loneheart - Can you say, "Dale in Chains"? Dale: Pssst - it's me! Lawhiney! Dale: Chip cloned himself in 'Private Pluto.' I say it's payback time! Dale's sister: OK, bro, here's the deal- you stop cross-dressing to look like me, and I'll stop cross-dressing to look like you. Dale: We go to all the trouble of dividing in two and Indy and Chris aren't even going to write chapter 11 of the Untold Ranger Tales. Evil Dale: Kill the mouse, make him scream. Unseen good Dale: No, you must not for Walt is watching and besides Warner Brothers did that last week. Dale 1: Gadget's hologrammatic clone generator is cool! Now, YOU can stay home and watch TV, while I take that goofy ol' Foxglove out to dinner! Too bad I gotta miss a new ep of 'Flash, The Wonder Dog! Dale 1: I TOLD you this disguise would freak them out! 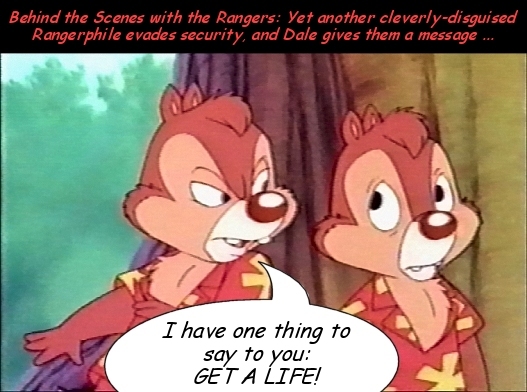 Dale 2: Why didn't you TELL me that last acorn was magical?! Dale: Y'know, being your stunt double is really taking a toll on my noggin when your in your "acting dumb" role. Now where's that Aflac duck at? I have a serious on-the-job injury report to fill out! I made the mistake of helping Gadget in her workshop again! Other Dale: Do I smell chocolate? Dale: Hey...don't I know you from somewhere?